The Lime Kilns are found along the Cactus Forest trail in the East or Rincon Mountain District of the Saguaro (pronounced 'sah-wah-ro' or 'suh-wah-ro') National Park near Tucson, Arizona. The kilns can be reached by starting at the North Cactus Forest trailhead and hiking 1 mile south or from the South Cactus Forest Trailhead and hiking 1.5 miles north. 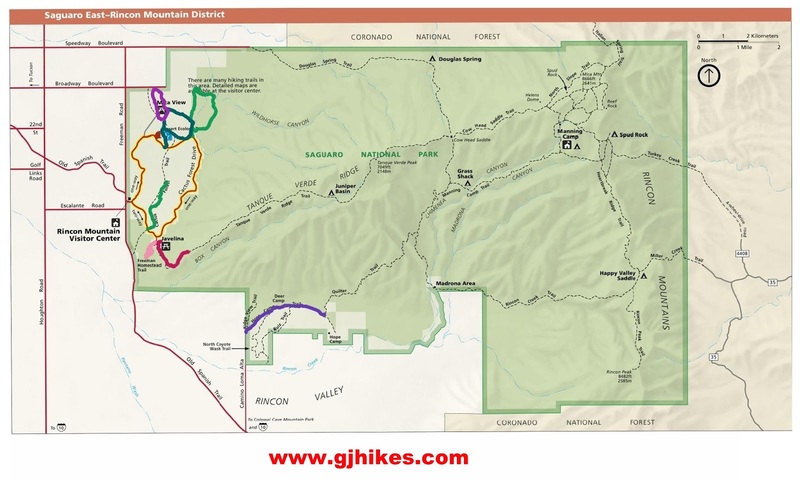 This post takes the longer of the 2 routes by beginning at the south trailhead and hiking north to the lime kilns and returning along the same route. The South Trailhead sits between the Visitor Center and the Javelina Picnic Area. The section of the Cactus Forest Loop Road between the Visitor Center and the picnic area is 2-way while the rest of the loop road is open only to one-way traffic. That means you can drive all the way around the loop until you reach the south trailhead, which is close to the Visitor Center, or you can take the short route by heading toward the picnic area from the Visitor Center. This section of the Cactus Forest trail is the only trail in the area that is also open to mountain bikes. The trail is easy to hike and very easy to follow. There are several places where the trail crosses washes that are probably dry for most of the year. The top part of the trail is mostly flat but it does fluctuate 50-60 feet in elevation before crossing a hill above the area where the lime kilns are. At that point it drops about 100 feet of elevation which is regained on the return trip. After about 1.7 miles the trail reaches a junction where a short spur trail runs up to Lime Falls. From that spot continue north on the Cactus Forest trail for about 50 to 100 yards where the kilns can be found on the east side of the trail over the wash. Lime kilns were used to make mortar and white wash from limestone. The limestone would be layered with wood until the kiln was full. The pile would be lit from the bottom where a vent would allow air to flow up through the stack. Here is a shot of a white tail deer that was browsing on the leaves of a nearby bush. This looks like a teddybear cholla cactus although it probably isn't all that snuggly. You probably have seen items made from cholla wood which can be bleached and sanded to make very nice looking knickknacks. It is illegal to collect cholla wood or anything else from a National Park but there are plenty of other places where it can be collected legally. Studies show that the omnivorous javelina pigs get almost half of their diet from the succulent prickly pear. They pay little attention to the spines which some say is due to having little feeling in their gums. The lime kilns are an interesting artifact along the Cactus Forest trail that are worth taking the time to visit. The kilns add a bonus to a trail that is fun to hike anyway. On this outing, besides deer, jackrabbits and cottontail were also spotted along with signs of javelina. If you would like to see it for yourself then all you have to do is 'Take a hike'.